Our next talk is this Sunday, 25 October when Donna Maguire, archivist and records manager to the Bishops Conference of Scotland, is coming to speak to us. 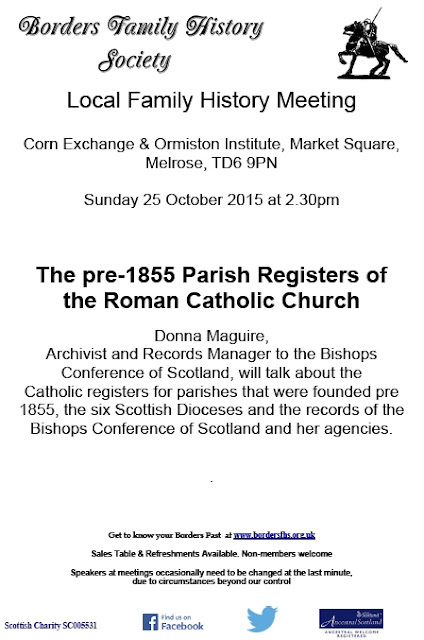 The title of her talk is ‘The pre-1855 Parish Registers of the Roman Catholic Church'. The talk takes place at the Corn Exchange and Ormiston Institute, Market Square, Melrose, TD6 9PN. Map. I’m eagerly looking forward to this talk. Donna is going to tell us about the Catholic registers for parishes that were founded before 1855, the six Scottish dioceses and the records of the Bishops Conference of Scotland and its agencies. Knowing how to find Catholic records is vital in family history, even if you think you have no Catholics in your family, you may be wrong, as I was. I suggest you come early to get a good seat.